Dodgers pitcher Ricky Nolasco is Wednesday's Player of the Day. Nolasco pitched eight scoreless innings and struck out 11 in the 4-0 win over the Cubs. White Sox pitcher Chris Sale is American League Player of the Day. Sale struck out 12 over eight innings and gave up only one run in the 6-1 win over the Astros. Sale moves up to 13th place in Box-Toppers player rankings for the season. He earns 1.7 Box-Toppers point for being AL Player of the Day, giving him 14.4 for the season. Brandon Moss of the Athletics is AL Batter of the Day. Moss hit two homers, drove in six runs and went 4-for-5 in the 14-4 win over the Tigers. Josh Harrison of the Pirates is National League Batter of the Day. Harrison scored three runs and went 3-for-4 in the 7-1 win over the Brewers. Notable: Reds pitcher Homer Bailey is in 33rd place in Box-Toppers player rankings after earning Player of the Game honors Wednesday. Bailey (7.1IP 0R 7K W in the 10-0 win vs. Cardinals) earns 1.0 Box-Toppers point, giving him 10.0 for the season. 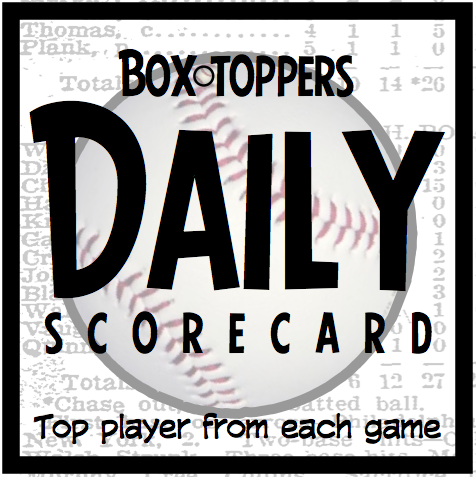 Nolasco receives 2.0 Box-Toppers points for being Player of the Day. Sale receives 1.7 for AL Player of the Day. Moss and Harrison each receive 1.5 for being top Batter of the Day in their league.